1. There is no more helpless feeling as a writer than when something you’ve written accidentally gets deleted somehow. Whether it’s a technological mishap, a corrupted file or just plain absentmindedness, to have gone through the trouble of constructing an entire piece—to have created something where before there was nothing—only to have it vanish before it’s unleashed upon the world is as excruciating as anything in this stupid business. But losing the piece is not actually the worst part of it. The worst part is reconstructing it. The worst part is trying to conjure back up what you wrote before, to produce some sort of simulacrum of the lost work. You know it’s not the same, that it’s not as good as it was before, that you can’t recreate the kismet of the first time, that you’ve now wasted your time twice. By the end, you wish you would have never started the thing in the first place. 2. It is impossible to say, if I hadn’t known that Christopher Plummer had been cast at J. Paul Getty in All the Money in the World after the film was already completed because of the sexual misconduct allegations against Kevin Spacey, whether watching the film would fill me, in pretty much every frame involving Plummer, with that same familiar sense of dread, remembering the pain of having to reconstruct something that was lost. But I cannot lie to you: It did. Plummer famously only had nine days to shoot his scenes, and, crucially, almost no time to prepare, to dig into what makes this key character, the most fascinating character in the film, tick. Plummer has said working in the theater helped fortify him for such a strange experience, and the theater training shows: The 88-year-old actor hits all his marks and lands on all the right emotional beats. But he still feels like he’s in an entirely different movie than the rest of his cast, even when they are in scenes together (especially when they are in scenes together). His scenes feel different: They feel, well, rushed. Is it possible that I only feel that way because I know about the offscreen turmoil? Perhaps. But I doubt it. You respect that director Ridley Scott and Plummer and the rest of the cast were able to cobble all this together, but it doesn’t make it feel any less strange. 3. One of the reasons Plummer’s bailout casting stands out so much is how integral he is to the film: His character is the reason it exists. His J. Paul Getty is the richest man on the planet—the richest man ever to live on the planet, he never fails to remind everyone around him—but refuses to spend any of it, living a miserable, miserly life of solitude on his various estates. In the film’s opening scene, his teenage grandson Paul (Charlie Plummer, no relation) is bumming around Italy when he is abducted by kidnappers, who, knowing his grandfather’s wealth, demand $17 million in ransom. Paul’s mother Gail (Michelle Williams) has been long estranged from her ex-husband, Getty’s son who has fallen into drug addiction, and wanted nothing in the divorce but custody of their children. She learns quickly that her father-in-law not only won’t negotiate with the kidnappers; he won’t pay them a dime. He instead dispatches the head of his security team, a former CIA agent named Fletcher Chase (Mark Wahlberg, who I guarantee you has used the name “Fletcher Chase” as an alias while traveling), to try to free Paul “as inexpensively as possible.” So we crosscut back and forth between Fletcher and Gail trying to figure out how to get Paul back, Paul being shuttled around various makeshift Italian prisons and Grandpa, in one of his castles, constantly staring at stock tickers and relenting no quarter. 4. Some of this works well. The scenes with Paul and his captors have a visceral intensity, and you could make an argument that the most well-rounded character is an Italian man (Romaine Duris) who initially grabs Paul but learns to care for him, for better or worse. Williams brings her usual smarts and vulnerability to the part of Gail, who’s the only one who seems to understand the severity of the situation, not that it helps her to do much of anything about it. She is a bit handcuffed having so many scenes with Wahlberg, an actor whose primary utility seems to be that he says his lines in the right order and doesn’t trip over any of the furniture. (Wahlberg needs a director insistent on making him weird, a Scorsese or a David O. Russell; otherwise he just plods forward, lunkheadedly and dully.) There’s a solid stemwinder of a story here, with kidnapping and international intrigue and the constant awareness of how much of this world is driven by wealth and yet stubbornly independent of it. When the movie gets away from the Getty castles and digs into the Italian dirt, it has the propulsion you’d expect from a Scott film: The guy can tell a story, still. 5. But you cannot escape the Getty scenes, and how could you? Is it sacrilege, offensive, to say that maybe Spacey would have been a little better in this role? That Plummer’s theatrical tricks, the twinkly old-man whimsy he falls back on, don’t quite give Getty the hard-edged soullessness, the downright cruelty, that Spacey might have provided? (And probably did, as glimpsed at in the initial trailer.) Maybe I shouldn’t say that? Maybe Plummer should be cheered simply for taking the role from a man who by multiple repeated accounts seems to be a sexual predator, even if the performance is thin and rushed? I can grant that, though I hope that also means you’ll make sure to insist that they scrub Spacey out of Baby Driver this awards season, as well. (Or for that matter, L.A. Confidential, or Se7en. Why stop there?) It is possible, even likely, that the world is a better place because Kevin Spacey doesn’t have the platform of this movie. But I’m not writing about the world. I’m writing about this movie. 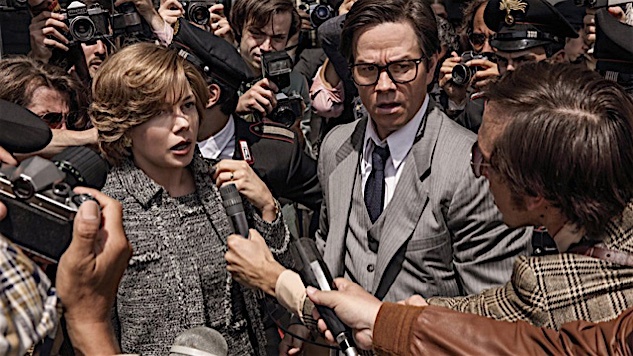 And for all the technical achievement on display, as impressive as it is that you could recast a main role in so short amount of time, All the Money in the World is disjointed and frazzled. I can’t believe they found a way to splice Plummer into this movie so quickly. Let’s hope no one ever has to do anything like that ever again.